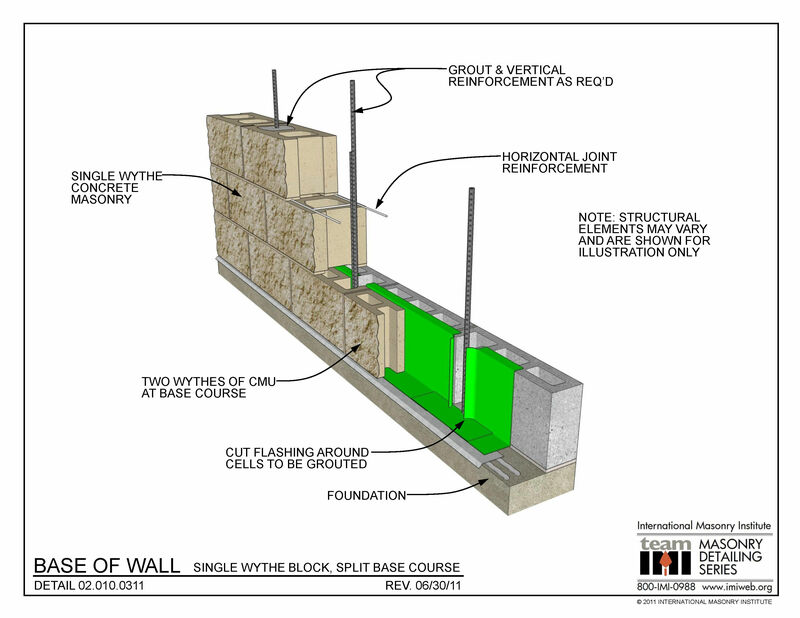 This detail shows an 8” (nominal) split face concrete masonry (CMU) wall, base of wall condition. The base course is divided into two wythes of 4” (nominal) CMU to allow for a vertical upturn to the flashing. The flashing is shown as a flexible material for the through-wall portion, transitioning to a sheet metal drip edge extending about ½” out from the face of the masonry. The flashing is interrupted at the vertical grout cells to leave the cell open to receive grout. Vertical reinforcement overlaps the foundation dowels to achieve sufficient development strength per structural design. Ladder-type horizontal joint reinforcement is placed at 16” o.c. vertically in the wall, or as required.